It can hardly be described as a crisis. Barcelona sit top of La Liga with an amazing 40 points from a possible 45 and are through to the second round of the Champions League as group winners. But two losses in the space of five days have taken the gloss off the Catalans’ superb season start. Under the surface, the cracks are beginning to appear – and now Gerardo Martino must move to fill them by signing in January. Neymar, so promising earlier this term, was expected to grow in the absence of the injured Lionel Messi. Instead, he has shrunk and, like the rest of his team-mates, seems to struggle against strong and physical opponents. 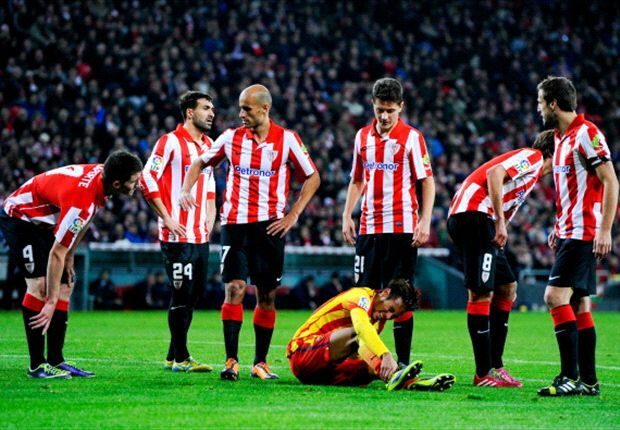 The Brazilian was fouled outside the area by Ander Iturraspe at 0-0 and Barca appealed for a red card for the Athletic midfielder. But it was only yellow and the Catalans were furious. In midfield, Xavi looked tired and again struggled in a high-tempo game, while the defence was given the runaround by Athletic’s aggressive forward line. Gerard Pique was poorly positioned for the goal and is increasingly culpable for Barca, while his partner Javier Mascherano is enduring a torrid time this season. And in the full-back positions, Martin Montoya and Adriano (playing in the absence of injured duo Dani Alves and Jordi Alba) looked out of their depth. With every passing week, the decision to dispense with Eric Abidal appears more and more ludicrous. With problems appearing all over the pitch, Martino must dip into the market in January, because Barca are now level on points with Atletico and only three clear of Real Madrid in La Liga, while they will face far stronger sides than Ajax in Europe at the end of the season. Instead, the league leaders must look at where they went wrong and, as the January window approaches, the time to act is now.